Recent estimates cite the risk-adjusted cost of bringing a new drug to approval to be north of $2.5 billion. This is a staggering amount, particularly when less than 10 percent of newly innovated therapeutics survive the clinical development process. Indeed, drug development is fraught with high costs and low probability of success. Biopharma companies need a way to change the cost-risk equation to ensure the balance is tipped toward informed development decisions that enhance returns. To help shift away from this expensive “multiple shots on goal” approach, drug developers are leveraging large genomics knowledgebases and powerful analytic tools to inject new life and reap newfound returns from therapeutic candidates once thought sidelined. Dubbed “drug rescue” programs, biopharma companies are using powerful computational algorithms to mine molecular information from “real world” patient cases. Now, clinical compounds once “shelved” for missing requisite clinical endpoints are garnering more than a second glance from their biopharma innovators. Take, for example, olaparib, a treatment for ovarian cancer targeting mutation in the BRCA gene. In 2011, olaparib was in a precarious regulatory situation after a review of Phase II clinical data showed the gain in progression-free survival was not likely to translate into an overall survival benefit for patients. In partnership with AstraZeneca, the developer of the drug, Foundation Medicine conducted a retrospective analysis of the responders using FoundationCORE™, a knowledgebase of more than 50,000 unique tumor profiles. This analysis identified a subset of responders – a BRCA-positive subgroup – with mutations that literally changed the statistical equation for the study. This finding resulted in revitalization of the program and ultimately, it led to regulatory submissions in Europe and the United States. Importantly, this has made a positive difference in the lives of women with BRCA-positive ovarian cancer. The advanced analytics of FoundationCORE uncover trends and patterns in cancer genes from common and rare tumors that would otherwise not have been found. Besides its ever-increasing breadth of cancer genomic information, the uniqueness of FoundationCORE is that the molecular information is gleaned from real world cancer patients. This provides biopharma organizations with key insights and trends that can’t be found from other public databases. 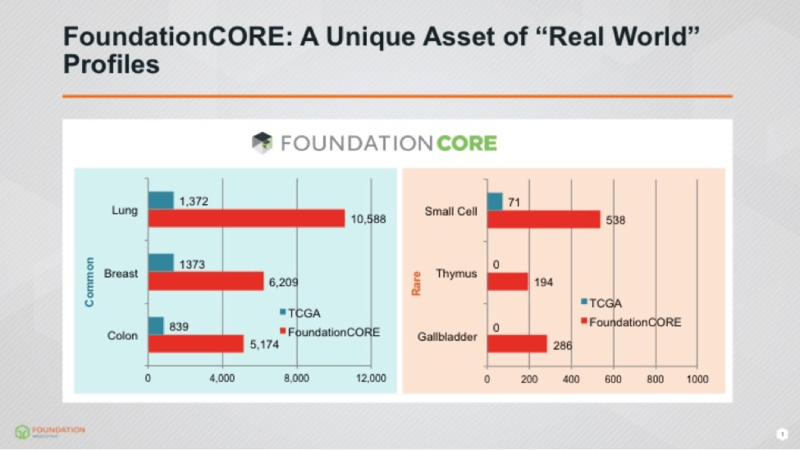 (See Exhibit 1 for a comparison of FoundationCORE to The Cancer Genome Atlas (TCGA)). For example, analysis can provide insights into how a spectrum of known oncogenic genomic changes in an established cancer gene (such as with ERBB2/HER2) can vary across a vast variety of tumor types. These alterations may sensitize tumors to multiple targeted therapies, both approved and in clinical development and also may provide a path to registration for previously failed therapeutic assets by enabling targeted clinical development in a context that was previously not appreciated. Further, discerning biopharma have embraced the genomics revolution and moved beyond the application of genomics and informatics in drug rescue to integrating molecular information and advanced analytics early in the drug development process. Today, we see applications in novel target identification and drug development. By using genomic profiling to ensure patients are molecular matches for the therapeutic candidate under study, biopharma companies can also maximize speed and efficiency and increase probabilities of clinical response for these therapeutic candidates. This shift from wet-lab chemistry to a dry lab bioinformatics approach is necessary in this era of personalized medicine. It’s catalyzing a mindshift in drug development from a “multiple shots on goal” clinical strategy to a strategy of “fewer, but smarter shots.” Ultimately, it’s translating to lowered development costs and higher probabilities of clinical and commercial success, ultimately enabling a win-win for biopharma and patients, alike.